Last night, we went for a family diner to celebrate my birthday. I didn’t fancy going to a typical French restaurant with 3-course meal because I can no longer stomach such heavy meals (can you!??) and I have a bunch of girlfriends arriving this weekend for a “girls weekend” so I wanted to pace myself. Instead, I wanted to do the two things I love doing the most when I’m in the Bay of Arcachon: Having a drink at La Co(o)rniche because I never get tired of the view of the Dune du Pyla and have oysters Chez Jejehne. Funnily enough, we bumped into friends at La Co(o)rniche so we ended up having drinks with them while the girls played together. After leaving our friends who were going back to Bordeaux, we headed to the Port de La Teste to eat oysters. Not big on planning these days, it turned out that our dining plan A: Chez Jejehne close at 6pm off season (9pm in July & August) so we head to dining plan B: Le Bistrot du Port d’Arcachon, a new place I had spotted last weekend and wanted to try (closed too). Steve then suggested Chez Yvette (one of the best fish restaurants in Arcachon) but I felt it was the exact ‘traditional restaurant’ feel I wanted to avoid. Instead we went to the the restaurant of La Ville d’Hiver boutique hotel where we had been before and had been impressed by the service and the food. If you haven’t been, I encourage you to try it next time. The interior design is quite moody with dark green and aubergine walls downstairs and vintage circus posters upstairs in the restaurant and the food is really nice. 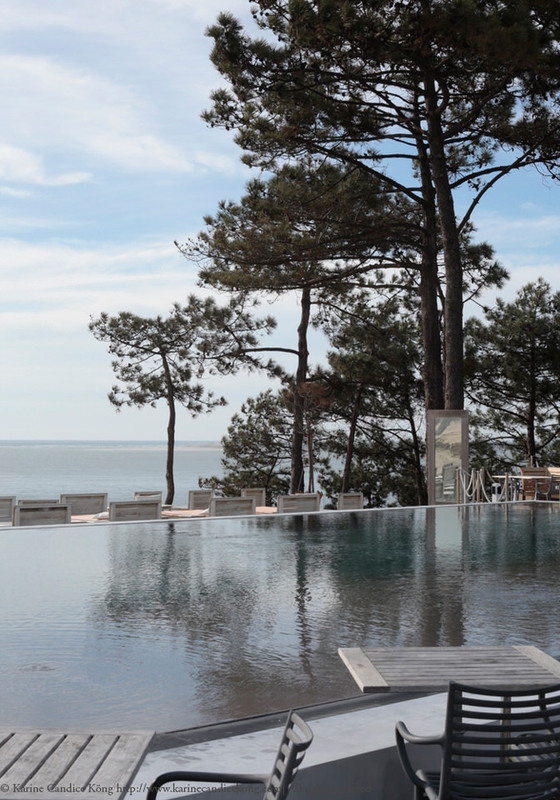 PS: If you fancy visiting the Bay of Arcachon, you can check our listings on Airbnb here and here. Useless at planning and many a birthday has been spent wandering round trying to find somewhere to eat. However it’s the company that counts and your birthday sounds fab. Happy Birthday for yesterday. Also I didn’t comment yesterday but you should do a post on just black biker jackets. Trying to find one myself. Do you know what brand the actual jacket was in your picture? Birthday beach dinner is really good idea!. I love the beach nature atmosphere. Belated happy birthday! Great post. Love La Corniche but really like the sound of La Ville d”Hiver & have never been. We’re back in Bisca for May half term when it’s my birthday so perhaps will give it a try. Thank you!